Earth receives its warmth from the sun. Because the world rotates on an angle to its path around the sun, radiation is spread more evenly and seasons are experienced worldwide. Read what underwater photographers need to know about light in the sea and other physical properties. Sea water consists of salt and other minerals. They are important for life. The ocean's physical properties like temperature, salinity and density are crucial to the ways in which the ocean water moves. The ocean's reservoir in resources seems inexhaustible, but is it? This chapter looks at the ocean's capacity to feed humans and to recycle their wastes. Also visit our large section about soil, its properties, geology and fertility and how we are losing it, perhaps the world's foremost problem! Read how the sea suffers and degrades, and read about our revolutionary discoveries about sick seas. go back to the oceanography contents index. The temperature of the surface of the Earth, the atmosphere, depends on a delicate balance between solar radiation from the sun and the Earth radiating it out back into space. Only a very small amount percolates up through the crust from the Earth's hot core. As the Earth rotates around its axis, day and night occur. Its once a year rotation around the sun would have been unnoticeable if the Earth's axis of rotation had not been tilted. Its tilt of 23.5 degrees, creates the seasons, which means, that every place on Earth experiences at least once a year, a period of intense sunlight, bright enough for life to blossom. Although the path of the Earth around the sun is almost perfectly circular, it stands closest to the sun in the June solstice, the northern summer. Being 1.7% closer, lands 3.4% more sunlight on the outer atmosphere, which is a noticeable amount in the radiation balance. But it is not only this that makes the northern summers warmer. Because the Northern Hemisphere is dominated by land and the Southern Hemisphere by sea, temperature differences between summer and winter are more extreme in the Northern Hemisphere (the land warms and cools more quickly than the ocean). In the diagram, average land and sea temperatures are shown for each place on Earth, from the North Pole (left) to the South Pole (right). New Zealand is located around 40º S, in the temperate climate zone, where land temperatures change about as much as sea temperatures. For our antipodes at the other side of the globe, the situation is much different. They experience hotter summers and colder winters. The temperate regions experience the largest seawater temperature changes and New Zealand is no exception. Notice that the difference between winter and summer, about 6-8ºC, amounts to shifting our country by 10-12º North-South for summer-winter. Note also that polar sea water has practically no temperature change, due to the stabilising effect of the ice. As this diagram shows, the tilt of the Earth has a profound effect on the amount of sunshine falling on its surface. In the tropics, seasonal variation is hardly noticeable (14%, twice yearly) but in temperate climates like New Zealand, the summer brings three times more sunlight (arising from both duration and intensity), than winter. For the poles, the difference is of course extreme, due to the polar night. Ironically, the amount of sunlight experienced in the polar summer, exceeds that in the tropics, due to the 24 hour polar summer day. For sea life, these curves are very important. Also on a daily basis, as we all know, the sunlight changes strength as we pass from night to day and into night again. The curve on the right shows the theoretical decline of sunlight intensity, depending on the sun's angle from vertical. Notice how steeply it drops off towards sunset/sunrise. By 7:30 AM and 4:30 PM (assuming 12 hours daylight), the sun has reached half strength. New Zealand is located roughly at 40ºS. Thus the sun's angle varies from 40 + 23.5 =63º in summer to 40 - 23.5 = 17º in winter, measured from direct overhead. This corresponds to about 40% variation in light intensity.. Compared to air, water has an extremely high heat capacity, so it takes much more sunlight to warm up. Fortunately, warm sea water is lighter than cool sea water, so the warmed water stays on top and is reluctant to pass its heat downward. As a result, the sea warms slowly but cools more quickly. During the summers a thermocline develops between the warm surface water and the cooler bottom water. As the sea warms further, this sharp boundary moves deeper. In New Zealand, the thermocline may descend to 15m. Sometimes a second thermocline is found at 40m depth, originating from the continental shelf. Towards winter, as the surface water cools, the thermoclines disappear. Also during heavy storms, the sea water may get mixed so thoroughly, that thermoclines disappear. The density of water does not only depend on temperature, but also on salinity and pressure, discussed in next chapter on physical properties and in currents. The deep sea has a temperature of -1ºC. Why are the middle of winter and summer experienced later than the sun/earth solstices? Anyone living in temperate climates, knows that the worst of winter is not over when the days start to lengthen again. The sun's winter solstice (in the north) is around 23 December, but winter has hardly begun and will be felt for at least another three months. Why this delay? It is hard to understand that, as the earth is warmed more, it is still cooling more. There is obviously some kind of inertia at work, but how? The earth's surface temperature is in a sensitive balance between incoming and outgoing radiation. After the winter solstice, the incoming radiation is undeniably increasing. The temperature at any one place on earth does not only depend on the above, but also on the temperature of surrounding land and sea. Ice formation is a slow and energy-absorbing process, that slows down cooling. Likewise, melting is slow and hinders the warming up. So, once ice has formed, or the temperature passes 0 ºC, the surface temperature lags considerably. Ice and snow bounce back the sunlight, so that the increased solar radiation does not result in more warming. Compared to earth and air, water is slow to warm or to cool. Water masses moderate temperature fluctuations. Warm water lies on the surface of lakes and seas. Heat is slow to penetrate to deeper layers, but cold water sinks easily to deeper waters. So, bodies of water absorb less energy when warming up, but absorb more cold when cooling off (release heat easily). Once a body of water starts to freeze over, it absorbs cold more slowly, so its moderating effect becomes much less. Water takes a long time and energy to evaporate. So, summer won't begin until (almost) all the winter's rain water has evaporated. 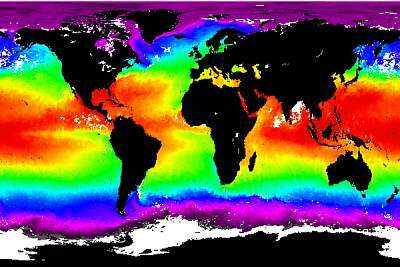 For Sea Surface Temperature (SST) images, visit the AVHRR home page at the John Hopkins University and NOAA/NASA AVHRR Oceans Pathfinder Monthly Sea Surface Temperature page which also provides background information. The TRMM home page in Japan has many global temperature and other maps. The main chemical constituent of seawater is salt (NaCl), a very simple chemical compound, that is found in the tissues of all living organisms. The oceans encompass about 5 billion cubic kilometre, or 5E21 kg. About 3.5% of that is salt, an unimaginable amount. It was thought that the salt in the oceans has accumulated over the 3 billion years or so, that rivers flowed into it, carrying dissolved salts from soil erosion, but if this was so, the oceans would have been far saltier than they are. So, simultaneous with the salt entering the sea, there must be an equal amount of salt leaving the sea. The mechanism for doing so, is not known, but salt may have been subducted under the continents, by tectonic movements. There it reforms with other salts into rock crystals. When the first organisms formed in the archaean sea, they did not have cell membranes. The whole sea acted as their bodies. Later organisms did develop membranes and were able to retain their body salts within. As the chemistry of the sea changed, the organisms developed abilities to extract salts and liquids from their environment and to maintain the liquids inside their bodies at constant concentrations. It seems as if every living organism today, carries inside it a remnant of the archaean sea. It is not surprising that the seawater elements marked blue in the above table, are essential to all life on earth. See also the periodic table and table of essential elements for plants, micro organisms and animals at the end of it. When plants started to live on the land, not only did they have to maintain their body fluids against the odds of drying out, but they also had to acquire the ability to scavenge nutrients from nutrient-poor soils, and to accumulate these into their tissues. Animals did not need this capability, because they ate the plants (herbivores) or other animals (carnivores). See also the table of the abundance of chemical elements for life, detailing the most abundant elements in the universe, our solar system, Earth, the ocean, plants, animals and so on. The sea is a strange world to live in, mainly because its physical qualities are so different from the land world. The water conducts and stores heat so well, that it is impossible to breathe water and be warm blooded at the same time (dolphins breathe air). Water is 800 times denser than air, so shapes that are successful on land, will fail in the sea. One needs to be streamlined there and use the water to propel oneself. One needs to be able to live in a medium that contains oxygen for breathing, waste products from living, disease organisms, pests, other organisms that can be caught and eaten, a medium that during storms tries to destroy you, and so on. For more discussion, read the introduction to habitats and biodiversity/marine. Water has a profound effect on light, limiting marine plant life to the top 20-50 metres and planktonic life to 100m depth. Underwater photographers have to understand how light diminishes with depth. Read in the water-and-light chapter about underwater photography, everything you need to know. 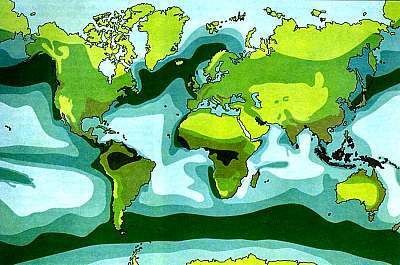 As can be seen from this world map, the salinity of the oceans varies between 30 and 37 (3.0 and 3.7%). In regions with high evaporation, the seawater becomes saltier, whereas salinity drops in the cooler regions, due to melting ice masses. Normal seawater has about 35 gram of dissolved salt per litre (leaving 965 gram of water), which makes it 24 g denser at 20ºC (see table below). You can make saltwater by adding 35 gram of sea salt to a litre of water. Swimmers notice that it is easier to swim in the sea than in fresh water, because they float better. An 80 kg person displaces about 80 litre of water. Each displaced litre is 24 gram heavier and provides as much extra flotation. In total: 80 x 24 gram = 1920 g = 2 kg! The sea water provides 2 kg more flotation. Divers know this, and they adjust their weight belts accordingly. Rather than mentioning the whole number 1.024 for density, scientists abbreviate it to two digits (24.0, e.g. ), and call it sigma (the Greek name for the letter s). They also spell it the Greek way, which we cannot do here, so we will call density sigma, by its full name, or just density. As can be expected, the density of seawater depends more on salinity than on temperature (see table). The density of sea water is also more sensitive to temperature than that of fresh water. Note the density maximum of 4.01 at 5º and salinity 5 (0.5%). (Actually 4.04 at 3ºC for 0.5% salinity) and a similar value for fresh water at 4.0ºC. This density maximum disappears for ocean water. Roughly speaking, cold fresh water (0º) is about 0.2% heavier than warm fresh water (20º). Cold seawater is about 0.7% heavier than warm seawater. Cold sea water is about 2.4% heavier than both cold or warm fresh water. How density affects ocean circulation, is discussed in the chapter about currents. Vertical: temperature ºC. Horizontal: salinity. Productivity on land depends on how well plants are growing. Plants need moisture, nutrients, carbon dioxide, sunlight and warmth. Depending on the reliable availability of these, plants will be more or less productive. Of the five requirements mentioned, moisture comes number one, with sunlight and thus warmth next. Although carbon dioxide is equally available all over the world, plants compete for this resource so fiercely that it limits the growth of most plants. Some plants do better than others in scavenging carbondioxide from the air. Since the nutrients in soils are reasonably well spread over the continents, these are not of prime consideration. The map on right, shows the productivities of both the land and the sea. Note that the colour scale for the land runs in four steps from 0 to 1000 gram carbon per square metre per year, but the scale for the ocean runs from 0 to 400. Per square metre, the oceans are thus less productive, but their area is nearly four times larger. Part of the reason for this, is that the sea water absorbs more light and that seas are not very much warmer during their productive summer seasons. A number of orbiting satellites, all in orbits crossing the poles, now record sea surface temperature and chlorophyll and a number of other parameters, around the clock. Here is a map of actual chlorophyll levels measured in September 1998 (northern autumn). September is the autumn month for the northern hemisphere but the spring month for the southern hemisphere. The sun then stands above the equator (equinox = equal night, equal night and day). Compare this map to the one above. When all seasons are combined, the two maps start to look alike. Notice how the temperate seas of the north have had their sunshine, resulting in a wide band of chlorophyll, whereas the southern oceans are just starting to bloom. Also very clearly, the areas of upwellings can be seen: along the west coasts of all continents and around Antarctica. The deep blue areas in the sea compare to the yellow areas on land, the deserts. Note also how the amount of chlorophyll has always been equated with productivity, which is not always true. The tropical rain forests for instance, have much green foliage and turnover, but their overall productivity is low. One of the latest observations in the sea is that areas rich in chlorophyll may in fact be eutrophicated (overnourished) and detrimental to life. Scientists have measured a reduction in zooplankton in seas with increased levels of chlorophyll. See also our most recent discoveries about degradation. In the early part of this century, Russian scientists discovered that plant life depends mainly on evapotranspiration, the rate of water transport from roots to leaves and out to the atmosphere. Evapotranspiration depends mainly on temperature and the availability of water, the two qualities along the horizontal and vertical axes of this diagram which plots the world's vegetation. Each of the vegetation classes also has its own soil type, rate of metabolism and standing stock (biomass). Note that the amount of sunshine depends on how cloudy the sky is, which limits growth in places with excessive rainfall. Notice also that high stands of vegetation limit the amount of sunlight falling on lower tiers. In the table on right, the various types of vegetation are compared with regions in the sea, and with human cultivation of the soil. Notice that the forests of the world are highly productive, and have a high biomass. Estuaries in the sea compare favourably with them. Although upwelling zones in the ocean are highly productive, their total area is only 1.5% of the continental shelf area. Note that the standing stock in biomass is very low in the ocean, even where productivity is high. Oceans thus turn over rather than accrue. Human cultivation compares favourably with that of the forests (because it is done on deforested soils), but its biomass varies enormously (grazing to rubber plantations). Plants in the sea have the same five requirements as land plants but moisture is always available. Plant plankton and algae do not evapo-transpire and their productivity depends mainly on the availability of nutrients. Sunlight and warmth depend on the height of the sun and much less on climate, but the ocean's main limitation is the availability of nutrients, particularly phosphorus, nitrogen and some trace elements (silica and iron). That is why the map shows high levels of productivity near the shores. Here the erosion of the land brings minerals and nutrients toward the coastal water. The continental shelves running somewhat parallel to the coast, are the most productive zones because they recycle nutrients easily and can be bottom-trawled. Etherington: Environment and plant ecology, 1976. The plant plankton organisms (phytoplankton) are the main producers in the oceans. The plankton community forms an almost closed ecosystem, but loses nutrients as dead organisms sink towards the deep sea bottom. It causes vast unproductive areas in the open oceans. Whereas forests are able to accumulate living matter in their leaves, stems and soils, the ocean is unable to do so. Thus ocean meadows are turn-over systems rather than stocking systems. Grasslands are also turnover systems, providing food for a large stocking density of grazers. A number of anomalies are immediately visible. In a band around Antarctica, an area where the water is cold and where sunshine is absent for nearly half a year each year, high primary productivity is found. This is because deep ocean water, rich in nutrients, is able to surface here, due to special temperature and salinity conditions. (See the chapter on currents). A dark band of oceanic productivity runs along with the Gulf Stream in the northern Atlantic and a similar band is found in the north Pacific. These are also places of deepwater upwellings, the places where whaling is done . Very highly productive upwellings are also found on the west coast of South America and Africa, near the Canary Islands, off Somalia and around Japan. These together, provide the bulk of the world's fish catches. See also the chapters on plankton and fishing. In this map, the original vegetation of the world is shown, before humans started to farm it extensively. Note how productivity on the land is largely dependent on climate and how very large areas of the continents are covered in either desert or tundra and ice. Compare this map with the previous ones and notice the kinds of vegetation that are the most productive. Note that vegetation maps from various authors do not show exactly identical boundaries, perhaps because these are difficult to define. For more information about terrestrial ecosystems, their soils and productivity, visit soil/geology. 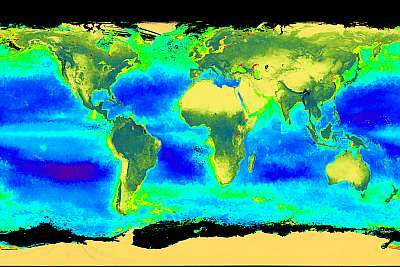 For actual and real-time maps of chlorophyll concentrations on land and in the sea, visit Nasa's SEAWIFS project. The CNES (Centre Nationale des Etudes Spatiales) has a very informative web site on their remote sensing satellite SPOT, atmospheric theory and complete references to all other remotes sensing satellites. The table below shows ocean productivity for the three largest regions in the world, excluding estuaries and mangroves. Because the open ocean is so much larger than the coastal zone, its total productivity is estimatd to be high. However, this figure may be misleading because of its low concentration of plant life (typically 10-30 times less than coastal regions), which makes fish like tuna difficult to catch (too few, too far between). The open ocean may also turn out to be far more productive (2-5 times) than estimated, due to the presence of mixotrophic zooplankton that live in symbiosis with plant cells, thus requiring no phyto plankton for growth, as they live primarily from sunlight and a mysterious dissolved organic carbon in the sea, discovered by us (slush). However, the catch statistics and trophic levels are accurate. phytoplankton> zooplankton> fish larvae> bait fish> tuna, which is five steps.